It is possible to over identify with an identity. It is not a good or bad thing, but it happens. You can over identify with your favorite sports team. You know who they are. You might be one of them. It’s not a good or bad thing, but it can be. You can over identify with your job – so much so that it becomes your life. Again, it could be a good or bad thing. I guess it depends on what you do for work. You can over identify with anything, and it might be good or bad. Here’s the thing. Over identifying with something always leads to bigger and “over” expectations. The more you identify, the more you expect. 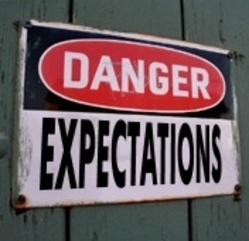 Over expections always lead to unrealistic expectations. Not a bad thing in certain contexts (marriage), and bad in othr contexts (you name it). 2. Be able to communicate it. I have made this mistake over and over again, and still do. I find myself expecting things from other far too much. I get upset with them. I also get caught up in my own identity with my surroundings. Being asked for spiritual guidance all the time, I have attached that to my own ego and I get offended by others when they don’t seek it out. Quite the problem for a 24 year old. It shows I know much more than I live. That’s not a bad place to be – the spiritual guidance guy. Live it and own it. The getting offending thing – will pass. It’s the role you play. It is you. Plus, that stuff doesn’t go away. You’ll probably deal with this stuff for the rest of your life. Isn’t it funny that they’re seeking you for wisdom and then you get upset. I love it. They keep coming back though. Thanks for checking it out. I’m still working on a response to the church and generation post.